Welcome to another edition of the Hearth and Soul Hop. 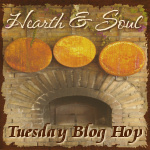 Hearth and Soul is a blog hop for recipes using healthy ingredients, family and comfort food recipes, articles about healthy living, real/slow/local/sustainable food, foraging, herbal remedies, organics and gardening. How are your holiday preparations going? I have nearly finished putting up the Christmas decorations so things are looking very festive. This week I’ve been baking my Aunt Dorothy’s Butterscotch Squares and my late Mom’s Mincemeat Oat Squares as well as stashing some Slice and Bake Cookies in the freezer ready for last minute entertaining. We are hosting our annual ‘nibbles and drinks’ party for forty plus people on Friday night so later in the week I’ll be making lots of delicious appetizers I will hopefully get a chance to share with you before Christmas. In ‘Dressed in White with Lights in Her Hair’, Marie Angelique of Musings of an Island Girl in Small Town America writes about the Norwegian St Lucia Day celebrations held every December 13 and shares a delicious recipe for traditional St Lucia Bread. Featuring molasses, rum and traditional Christmas spices, Joe Frogger Cookies have been a part of Barb of A Life in Balance’s family celebrations for many years. These cute Santa Pancakes from Kara of The Joys of Boys look like a Christmas tradition in the making! I know it’s a very busy time of year but I hope you will take the time to share a recipe or two with us this week. Please share the hop badge to help promote the hop. Sign up for my weekly newsletter in the box below the comments/above the linky and never miss a post! I just love this time of the year with all the special treats. Hope you are staying warm and cozy during this extreme cold. Have a great week and thanks so much for hosting the party! Me too, Miz Helen! Actually, we’ve been so lucky here in England, it’s been unseasonably warm the last couple of days. I’ve been concerned to hear about how cold it is in North America. Take care! I just got the chuckles from those cute Santa pancakes… sounds like quite a party you will be having… enjoy and thanks for this one. I thought they were so cute, Diane, I just had to feature them!! Thanks for the feature April! It is funny how this recipe has been one of the most popular posts. I love the tradition behind the St. Lucia bread. Hi. I’m new to your party and so glad I found it from the Mums Makes Lists calendar. I’m adding you to my link party page and will stop back each week!